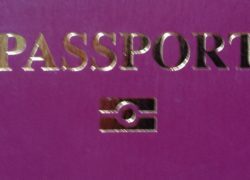 An e-Passport contains an electronic chip. The chip holds the same information that is printed on the passport’s data page: the holder’s name, date of birth, and other biographic information. An e-Passport also contains a biometric identifier. The United States requires that the chip contain a digital photograph of the holder. All e-Passports issued by Visa Waiver Program (VWP) countries and the United States have security features to prevent the unauthorized reading or “skimming” of data stored on the e-Passport chip. A tightening of rules at the start of April in the wake of another shooting means anyone visiting the country must have a bio-metric epassport. However, Brits who were issued passports between April and October 2006 are now being refused entry as their documents no longer qualify. Instead, they must apply for a visa from the US embassy or consulate, a process that can take up to 72 hours (or longer). The new ePassport is readily identifiable from the front cover – as seen in the picture above. The symbol is a rectangle bisected with a horizontal line and a circle in the middle. 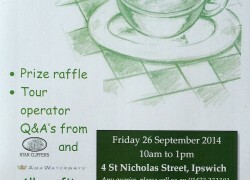 Stuck for something to do this weekend? 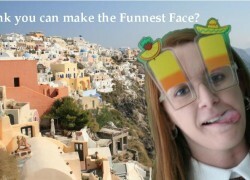 Think you have what it takes to be part of the Funnest Photo? Then meet us all at Maritime this Sunday, 16 August 2015 down at the Ipswich Waterfront and have your photograph taken on board the Carnival Vista. 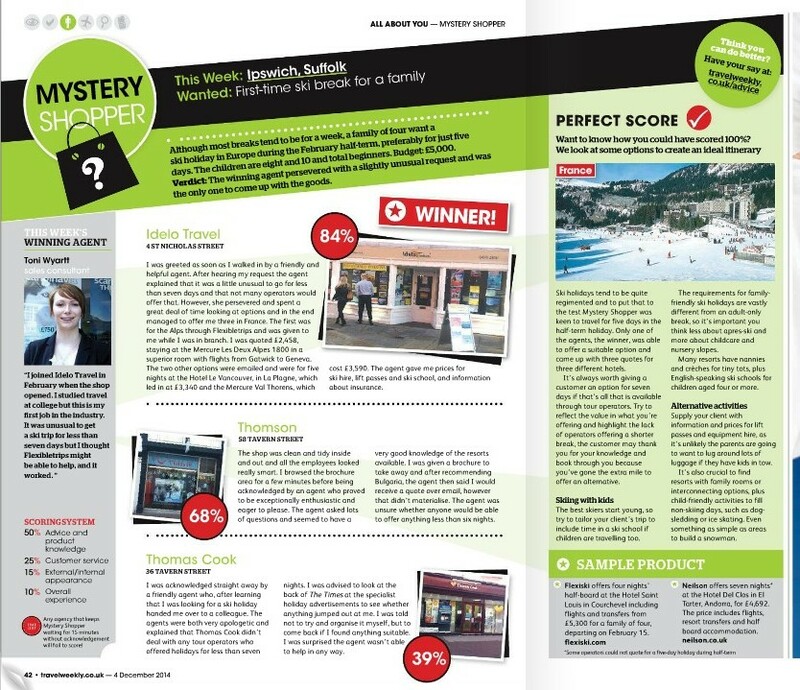 No we have not quite managed to get a 135,000 ton cruise ship into Ipswich Docks – though that may have been nice! – But we do think we have the next best thing. 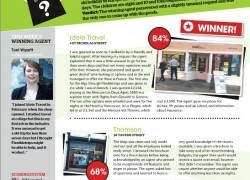 Idelo Travel are amongst 5 Finalists in Carnival Cruise Lines Funnest Travel Agent competition. Our idea for having fun is for you to have your funnest face/pose pictures taken against a number of backdrops all taken from the Carnival Vista or one of her exciting ports of call this summer. A posh Atrium aboard the Vista, perfect for that Evening Dinner shot, maybe with a bit of Romance? Carnival’s own private Bahaman Island – Half Moon Cay – hula skirts – for ladies AND men and children – one for the Groups amongst you maybe? To finish, a couple of great ports on the Carnival Vista itinerary as she sails the Mediterranean this summer. Firstly – to Rome and the Colosseum. Wrestling or posing, this is a great one for the Lion’s amongst you! And secondly, have you ever tried to hold up the Leaning Tower of Pisa – with just one finger? No, well now is your chance. And make sure you are wearing your best lipstick smile….! And to go with each scene there are also the glasses, the hats, the funny lips, the pirate props and many many others. So much choice. So much fun. Which will you decide upon…? So how can you win? And what can you win? If you are eligible for more than one category then you can choose which one to enter. The winner in each category will then go forward to ‘Funnest In Show’. This will be chosen from votes cast by our Facebook followers and the winner will receive the first prize of £500 off of a Carnival Cruise. We hope you can all make it and look forward to seeing you Sunday! When the heat of the summer gets too much, I always like to take myself to cooler climes. Alaska being one such trip. This was no ordinary trip. It happened to be our honeymoon. “I’m not getting married in the sweltering summer heat,” insisted hubby-to-be. But I had other ideas. 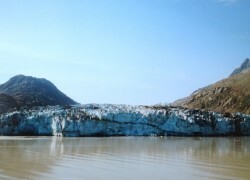 I had always dreamed of the glaciers of Alaska and late July/August was the perfect time to go….. Setting sail from Vancouver, it was a glorious day. Watching a playful seal pup in the harbour, sunning myself on our balcony, sipping champagne and munching on chocolate coated strawberries, it was just the perfect start to the trip that I had dreamed of. But it did not last….. Soon the weather turned in. Imagine, our first sea day – picture perfect – sun on my back, wind in my hair as I leant over the balcony to see whales breaching in the distance. Reality – woolly hat, blanket, Stiff Upper Lip – being the only two passengers who insisted on still sitting on the outside sunbeds, blowing a gale, even if there were whales visibility was such we would not have seen them. This was not part of the script. I was quite glad when we arrived the next day at our first port – Ketchikan – though still with an amount of trepidation at the inclement weather. Gut-wrenching disappointment. I was so looking forward to our Misty Fjords and Brown Bear trip. It was the perfect time of year to see the bears fishing for salmon. Our own perfect trip for two – all arranged. The only thing I could not plan for – the mist. 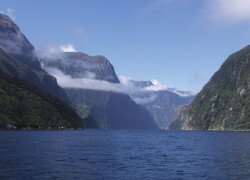 In the Misty Fjords. Wasn’t that the whole point…? Evidently not. They could be misty, but not that misty. This was too thick to fly a seaplane through. But…, wait a minute…., “…. Extra time just with the brown bears. Is that OK?” I turned to newly-wed hubby who was smiling at me as if I had just won the lottery. In my haste to expect the worst, I had missed half of the conversation. But apparently, the Misty Fjords were indeed too misty, but we could go straight to the place with the bears and spend the additional amount of time there instead. And did I mind? MIND? I was ecstatic. Way to go! As we strained to see the scenery below us (well it was still misty), my stomach turned at both a sudden lurch from the seaplane and the anticipation of what lay ahead. Bears are such fascinating creatures, so strong despite looking cuddly. At least in the hide I would be behind glass which would at least help with the urge to run over to cuddle one! With an “I’ll be back at 12,” our floatplane was off. Our setting so remote and isolated. I felt the enormity of being such a small person in such a huge expanse – so far away from anyone or anything. Amazing. As Golden eagles circled, this was not quite like the seagulls of Felixstowe, except for their confidence and lack of fear. I thought briefly of our strict instructions. You have not got any food with you have you? Stay on the guided walkways. IF you encounter a bear around a corner the last thing you do is run. Instead club together, make yourself large and sing. Hubby’s response – I’d really quite fancy meeting a bear. Are you MAD? Fortunately, or sadly, depending on who you ask, I did not have to discover whether that was just bravado or a genuine desire, we did not encounter any bears on our walk to and from the hide. As the first bear peeped his head out from the woods I gasped in excitement. He stole his way down the jagged hillside, lumbering towards the stream. Suddenly pounce! Proudly he had the catch in his teeth and made his way back into the woods to consume. At one point we were able to go into the hide at ground level. We were now just a few inches from the bears. I could see his fur standing on end, providing protection from the water. It was thoroughly absorbing and enthralling. Our three hours up and time to return. Next stop a helicopter transfer to our dog sledding trip on a glacier. How many ‘excellent’ does that tick off. Stunning scenery and cuddly animals that this time I could actually touch. And puppies!!! The cutest ever. Before they could ask who would like to hold one I was at the front of the queue. And yes, they were as cuddly and cute as you could imagine – and more! Our final trip on land, the impressive White Pass & Yukon Railway. A truly breath-taking way to see the area with spectacular scenery and waterfalls tumbling down the mountainside just inches from our carriage. As for the town itself, Skagway felt like taking a step back in time to an American bygone era. Despite all our incredible experiences that had gone before, maybe our best day was reserved for the glacier cruising in the aptly named Glacier National Park. As the sun beat down, we had an absolute prime position on our balcony, facing the great wall of ice. Such a translucent blue, but in places dirty, littered with centuries of dirt, stones and rock that it had calved out of the valley. It looked as if it needed a wash! The ship had sailed as close as the Captain would allow. As we watched, all was calm. Then slowly small fragments began tumbling into the sea. Was this it…? But no. We continued to stare at the glacier for several minutes more. Transfixed. Our eyes began to play tricks. Willing something to happen. “Oh I’m bored of this,” came the voice of our neighbour, “I’m off to the Burger Bar.” Hubby and I exchanged knowing glances…. You could get a burger anytime (no literally you could). We had but a couple of hours here. Making ourselves comfortable again on our balcony, enjoying the sun and the impressive view, we heard others, similarly bored. There was a strangely beautiful silence as we were one of only a handful left watching. Then suddenly. We first heard the roar. With a rush of water, ice, and rock crashing into the bay, a large piece had carved its way from the glacier. The noise was quite overwhelming. Much louder than you would imagine. Then almost as quickly as it happened there was silence again. Calm had been restored in a flash. Fragments of ice floating in the water bearing the only evidence of such a spectacle. A truly special moment. With Glacier Bay being our last day it was soon time to disembark for our overnight stay in Anchorage. But the fun did not end there. I had a horse riding trek planned. A chance to explore the forests and stunning wilderness. Cantering along valleys then sitting firm as the sure-footed horses clamoured down steep hills, it was a spectacular and exhilarating trip. Reunited with hubby who had been exploring the area on foot, my red face and large beaming smile said it all. A great end to a great trip. “Where” said the operator. “Is this a joke”. We were trying to telephone for a taxi to collect us from the stables – as usual in the middle of nowhere. As he dropped us off, pointing “it’s up there,” we had been slightly nervous that the taxi driver would not return for us at the agreed time. However, keen to continue our adventures we had dismissed any negative thoughts for later. Which had turned into now. I moved to sit on a nearby rock, curled up in a ball, my despair palpable. Time dragged, ten minutes became fifteen, became twenty. “He’s not coming” I said for about the twentieth time. I guess at least some tact and diplomacy skills had surfaced. “It’s OK dear” hubby comforted, “they will.” “Maybe we gave them the wrong address”. We had finally gotten through to the switchboard operator that yes, we were without a car in the wilderness of Anchorage and yes we were genuine. “No dear, I’m sure it will be fine”. “Well can’t you just phone and check again”. I looked up with anxious ‘Do Something’ eyes. As he went for the mobile in his pocket we heard the sound of a car. Turning expectantly…., but no. No this one. It turned off before reaching us. “Should we start walking?” “No dear, they will not find us then”. “Well you’d better check they know where to come. Please”. Reluctantly he dialled the number. Then sounds of another car emerged. This one did not turn off. It was coming, yes. Phew! Relief. This was us. Finally. That evening, we found a delightful Anchorage pub. The moose head on the wall, wooden floors, fireplace which no doubt glowed on those cold and dark winter nights – in fact everything you would imagine it to be. As we tucked into the best beer battered fish and chips I think I have ever tasted we reflected on our wonderful trip. Not necessarily a natural honeymoon choice or destination for all but for us….perfect. And after all that’s all that mattered really. 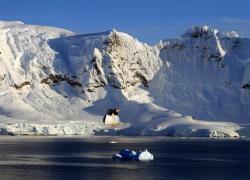 Where are Adelie Penguins most commonly found? Send your answer to beinspired@idelotravel.co.uk before 11am Sunday 21 December 2014 and if you have also Liked our Facebook page then you will be entered into the draw to win this loveable pair. PLEASE NOTE, YOU WILL BE REQUIRED TO COLLECT MONTY AND MABEL FROM THE SHOP along with proof of ID. We are unfortunately unable to send out by post. 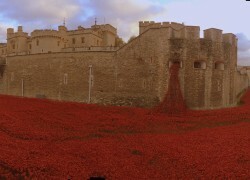 Having a day out of the office today, I visited the poppies at the Tower of London. Following recommendations from several customers I just had to see them for myself. Taking a moment to reflect on the beauty but also the message – each a British military fatality during the war. As the sea of red represented by over 888,000 ceramic poppies surrounded the Tower it was a brilliant and fitting tribute. The crowds, contemplating, old and young standing side by side, all fascinated by this stunning work of art. For me that is what London does best. Always at the forefront, buzzing but relevant. Whether you are into shopping, shows, culture or art, it is amazing to have one of the best capital cities in the world just an hour away. Maybe you will not have a chance to see this exhibition, but there is always something going on in this awesome city. And being so close we can all too easily take it for granted. So whether a shopping day and show or weekend break for yourself; or even a gift for Christmas – afternoon tea, a stadium tour, jet boating on the Thames or a View of the Shard – there is always a reason to visit London. Live Like An X Factor Contestant! You too could ‘live like an X Factor Contestant’. 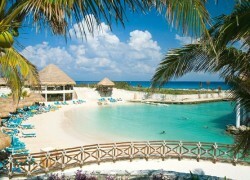 The Occidental Grand Xcaret in the heart of Riviera Maya, Mexico will be featuring this weekend as Mel B’s Judges’ House! For the coming week, we have a special offer on for a 7 night All-Inclusive stay starting at just £895 per person. Located adjacent to the spectacular eco-archaeological Xcaret Park, this resort has an incredible range of amenities, including 11 restaurants (1 exclusively for Royal Service guests) and 10 bars, 5 swimming pools, tennis courts and organised activities. In addition, you can also opt for a more luxurious experience at their exclusive Royal Club. Here guests will be treated to private VIP access to an additional Restaurant & Lounge and Pool. So if the Xcarat has the X Factor for you, then come and see us now! With sweeping landscapes, jagged mountain peaks, sparkling beaches, scenic fjords, raging rivers and pristine lakes, New Zealand certainly has stunning scenery. But it is also an adventures paradise, with scuba diving, hot air ballooning, rock climbing, and other such extreme sports. Finally, the culture – be it the traditions of both Maori warriors and British settlers or the chance to sample the delights of major cities like Auckland, Christchurch and Wellington. If you or anyone you know is interested in taking a trip of a lifetime to New Zealand then be sure to contact us this week to register for our Specialist New Zealand evening to be held in our upstairs lounge at the shop on Tuesday 9 September. With a Presentation followed by Q&As from a renowned Tour Operator as well as on-the-night offers and the chance to sample some local wines and nibbles, do not miss the chance to find out all you ever wanted to know about this country that is seemingly ‘at the end of the world’. Spaces are limited so call us today on 01473 231181 to secure your place. If you know of anyone who is planning on getting married either later this year or next then meet Idelo Travel at the Grand Bridal Fayre this Sunday 31 August 2014 – at Greshams, Tuddenham Road, Ipswich. We will be offering a special On-The-Day-Only money off voucher for either your Wedding or Honeymoon Package to all Brides who visit our stand and there is also a prize draw for those accompanying the Bride To Be.